The sixth Freep Film Festival kicks off Wednesday night with a documentary that "celebrates some of the rowdiest, most exciting journalism ever produced in the Motor City," the event's executive director says about "Boy Howdy! 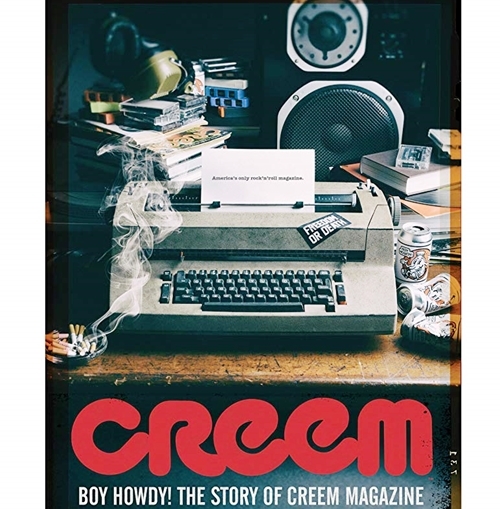 The Story of Creem Magazine." "The Fillmore couldn’t provide a better backdrop for a documentary that digs deep into one of the richest musical eras in Detroit’s history," festival executive director Steve Byrne adds in a release. The producers are Jaan Uhelszki, a founding editor, and JJ Kramer, son of original publisher Barry Kramer. Uhelszki also is a co-writer. Former Creem writer and editor Susan Whitall, a former Detroit News reporter and author of two music books, is associate producer. MC5 guitarist Wayne Kramer composed original music. Alice Cooper, Chad Smith and Jeff Daniels are in scenes. Joan Jett and Gene Simmons are among other musicians on screen. “Capturing the messy upheaval of the '70s just as rock was re-inventing itself, the film explores Creem Magazine's humble beginnings in post-riot Detroit, follows its upward trajectory from underground paper to national powerhouse, then bears witness to its imminent demise following the tragic and untimely deaths of its visionary publisher, Barry Kramer, and its most famous alum and genius clown prince, Lester Bangs, a year later. "Fifty years after publishing its first issue, ‘America's Only Rock 'n' Roll Magazine’ remains a seditious spirit in music and culture." In a Freep preview this week, Julie Hinds says the footage "evokes a time and place where the ceaseless dedication, percolating fury and edgy humor of Creem's staff seem almost mythic compared to today's entertainment reporting." Its prose attitude was the equivalent of beat poetry, shock jockery and bawdy Shakespearean drama all blended into fighting words by writers who desperately cared about music. Hinds boldly predicts Crawford's work is "poised to join the ranks of essential pop-culture documentaries." After Wednesday's downtown screening, Freep entertainment writer Brian McCollum will moderate a discussion among JJ Kramer and executive producer Margaret Kramer, Crawford, Uhelszki, Whitall and music producer Don Was. Friday, 9:30 p.m.: Emagine Royal Oak ($10, standby "rush line" seating). Discussion afterward moderated by Ryan Patrick Hooper of WDET, with JJ and Margaret Kramer, Uhleszki and Whitall. Saturday, 8 p.m.: Detroit Institute of Arts, Danto Lecture Hall ($10 advance tickets available. Panel moderated by Ann Delisi of WDET, with JJ and Margaret Kramer and Whitall. Details are here on 90-plus screenings around Metro Detroit.